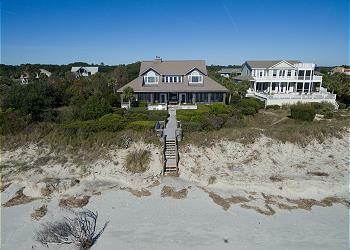 We are glad to be able to offer a large selection of pet friendly rentals on Seabrook Island. As a premier vacation rental and real estate company in South Carolina, we understand how important it is to bring along your four-legged friends. With rentals ranging from 1 to 5 bedrooms, we are sure to have the perfect rental for you and your furry friend. As the best pet friendly South Carolina beach rentals, our selection of Seabrook vacation rentals that allow pets are spacious and accommodating. Choose from large well-appointed houses to small cottages on the water, each allowing pets. If you know when you would like to stay, enter dates to quickly see our available Seabrook Island pet friendly rentals. You can also sort by the number of bedrooms or filter by the complex or the type of view. Don't hesitate to contact us with questions or for help reserving your Seabrook Island pet friendly rental. One of our most requested homes. TRUE OCEANFRONT. Dual living areas. screened porch. WIFI. Grill.